Chris introduced us to our local guide for the day, Barry (from Bristol) and driver, Alan, and we headed out for a tour of London. Throughout the afternoon Barry shared laughs, history, political commentary and his affinity for London. We learned that London is the smallest major city in the world - just one square mile - and that Trafalgar Square is right in its center. We stopped at St. Paul's (the people's church), crossed over the London Bridge and the Tower Bridge with spectacular views of Parliament and Big Ben, heard about the London Dungeon, the Crown Jewels housed in the Tower of London, passed Lloyd's of London, the Bank of England, new Scotland Yard, Somerset House, the National Gallery at Trafalgar Square, Downing Street, Westminster Abbey, Buckingham Palace, Hyde Park, Royal Albert Hall and Kensington Palace (home of Princess Diana while she was married to Charles and also after their divorce). We saw two different protest groups - one opposing the war in Iraq and one in favor of climate change. The climate change protesters were hard-core: they climbed the slate roofs of Westminster to hang their banners and sit on the rooftop! Barry shared a ton of information with us. Everything was covered from Henry VIII, to the Magna Carta; William Fiske to the role of the Lord Mayor of London. 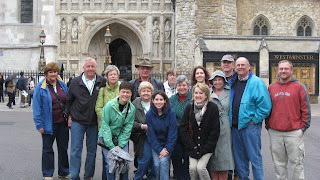 While we weren't able to stop at all the sites, this tour was a great introduction to London and has gotten folks thinking about how they want to spend their free time later in the week. We returned to the hotel and checked into our rooms. We have about an hour and a half and then we meet for dinner at a local restaurant.